August 9 marks the Anniversary of the day on which Nagasaki was devastated by an Atomic bomb, Fat Man, which was dropped by the United States B-29 Bockscar during World War II on August 9 1945. 35,000 people were killed outright, including 23,200-28,200 Japanese war workers, 2,000 Korean forced workers, and 150 Japanese soldiers. For 12 months prior to the nuclear attack, Nagasaki had experienced five small-scale air attacks by an aggregate of 136 planes which dropped a total of 270 tons of high explosive, 53 tons of incendiary, and 20 tons of fragmentation bombs. Of these, a raid of August 1, 1945, was most effective, with few of the bombs hitting the shipyards and dock areas in in the southwest portion of the city, several hitting the Mitsubishi Steel and Arms Works, and six bombs landing at the Nagasaki Medical School and Hospital, with three direct hits on buildings there. While the damage from these few bombs was relatively small, it created considerable concern in Nagasaki and a number of people, principally school children, were evacuated to rural areas for safety, thus reducing the population in the city at the time of the atomic attack. Within less than a second after the detonation, the north of the city was destroyed. Roughly 39,000–80,000 people were killed. About half of these died immediately, while the other half suffered lingering deaths . Among the deaths were 6,200 out of the 7,500 employees of the Mitsubishi Munitions plant, and thousands of others (including 2,000 Koreans) who worked in other war plants and factories in the city, as well as 150 Japanese soldiers. The industrial damage in Nagasaki was high, partly owing to the advertent targeting of the industrial zone, leaving 68–80 percent of the non-dock industrial production destroyed. The bomb was somewhat more powerful than the “Little Boy” bomb dropped over Hiroshima, but because of Nagasaki’s more uneven terrain, there was less damage. The International Day of the World’s Indigenous People is observed annually on August 9 to promote and protect the rights of the world’s indigenous population. The event also recognizes the achievements and contributions that indigenous people make to improve world issues such as environmental protection. It was first pronounced by the General Assembly of the United Nations in December 1994, marking the day of the first meeting of the UN Working Group on Indigenous Populations of the Subcommission on the Promotion and Protection of Human Rights, in 1982.The International Day of the World’s Indigenous People was first pronounced by the General Assembly of the United Nations in December 1994, to be celebrated every year during the first International Decade of the World’s Indigenous People (1995 – 2004). Dickinson encountered Iron Maiden in 1980 while they were supporting Samson at the Music Machine and was subsequently asked to join Iron Maiden, replacing Paul Di’Anno as lead singer. Iron Maiden hail from Leyton in east London and were formed in 1975 by bassist and primary songwriter, Steve Harris. They were Pioneers of the New Wave of British Heavy Metal, And achieved success during the early 1980s. Iron Maiden released their debut album, Survivors, in 1979 two months before Dickinson joined. Immediately following the completion of his University work, he met up with the band at Greenwich’s Wood Wharf studios to learn the Survivors album. It was during these early rehearsals that the nickname “Bruce Bruce” came about, derived from Monty Python’s “Bruces sketch”. Dickinson debuted on their 1982 album The Number of the Beast. Iron Maiden’s third album, The Number of the Beast, was released in 1982 for which Dickinson contributed to “The Prisoner”, “Children of the Damned” and “Run to the Hills”. Dickinson also contributed On the following albums, 1983’s Piece of Mind and 1984’s Powerslave, on the singles “Flight of Icarus” and “2 Minutes to Midnight”. In 1985 Iron Maiden released their next album, Somewhere in Time. 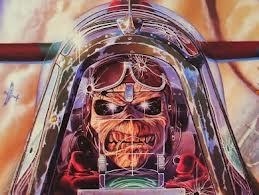 Iron Maiden’s next album Seventh Son of a Seventh Son, featured more progressive rock elements for which Dickinson wrote seven songs. Adrian Smith then left Iron Maiden, and was replaced by Janick Gers and In 1990 Iron Maiden released their eighth album No Prayer for the Dying. Which featured Dickinson’s song “Bring Your Daughter… to the Slaughter”, Which was composed for a film soundtrack, and despite receiving a Golden Raspberry Award for worst original song in 1989, became a Number One single. Outside his career in music, Dickinson is well known for his wide variety of other pursuits. He was also a commercial pilot for Astraeus Airlines, which led to a number of media-reported ventures such as captaining Iron Maiden’s converted Boeing 757 (Ed Force One) during their world tours. Following Astraeus’ closure, he created his own aircraft maintenance and pilot training company in 2012, Cardiff Aviation. Dickinson presented his own radio show on BBC Radio 6 Music from 2002–2010, and has also hosted television documentaries, authored novels and film scripts, created a successful beer with Robinsons Brewery and competed at fencing internationally. British Motor Racing Driver and 1992 Formula One World Champion Nigel Mansell, CBE was born 8 August 1953 in Upton-upon-Severn, Worcestershire, England. He won both the Formula One World Championship (1992) and the CART Indy Car World Series (1993). Mansell was the reigning F1 champion when he moved over to CART, being the first person to win the CART title in his debut season, making him the only person to hold both titles simultaneously. His career in Formula One spanned 15 seasons, with his final two full seasons of top-level racing being spent in the CART series. Mansell remains one of the most successful British Formula One drivers of all time in terms of race wins with 31 victories, and is fourth overall on the Formula One race winners list behind Michael Schumacher, Alain Prost and Ayrton Senna. He held the record for the most number of poles set in a single season, which was broken in 2011 by Sebastian Vettel. Mansell was also rated in the top 10 Formula One drivers of all time by longtime Formula One commentator Murray Walker. In 2008, American sports television network ESPN ranked him 24th on their top drivers of all-time. He was also ranked No. 9 of the 50 greatest F1 drivers of all time by the Times Online on a list that also included such drivers as Alain Prost, Ayrton Senna, Jackie Stewart and Jim Clark.Mansell raced in the GP Masters series and signed a one-off race deal for the Scuderia Ecosse GT race team to drive their number 63 Ferrari F430 GT2 car at Silverstone on 6 May 2007. He has since competed in additional sports car races with his sons, Leo and Greg, including the 2010 24 Hours of Le Mans. To date, he is the most recent inductee to the International Motorsports Hall of Fame from a country other than the US, having been inducted in 2005. He is also the current President of one of the UK’s largest Youth Work Charities, UK Youth and is also President of the IAM (Institute of Advanced Motorists). Best knwn as the guitarist with British second wave ska band Madness Chris Foreman, was born 8 August 1956, London. nicknamed ‘Chrissy Boy’, Foreman started Madness with Mike Barson and Lee Thompson in 1976. Foreman was one of the group’s main songwriters, mostly writing music with other members, usually Suggs or Lee Thompson, providing the lyrics. After Madness disbanded in 1986 he formed a new band The Madness with Thompson, Suggs and Chas Smash but they broke up after releasing one album. Then he, alongside Thompson, created another group called The Nutty Boys with Thompson on lead vocals. They released an album called Crunch! in 1990. The band are now known as Crunch!, and play in London every couple of years. Foreman began using a mobile phone attached to his guitar to record short videos from his position on stage during live Madness performances to provide fans with a unique perspective from the “guitar’s eye view”. He coined the term “Axecam” to describe this filming technique. By December 2008, he had acquired a higher quality digital video camera which he attached to the shoulder strap of his guitar using an “Axecam holder”, crafted by a member of the stage crew just before Madness went on stage at the O2 Arena on 19 December 2008. The new “Axecam” produced a far more stable picture and Foreman posted the first video from this performance (“It Must Be Love”) to the MadnessStudio2008 Channel on YouTube on 20 December 2008. Foreman also maintains a series of videos made with the Axecam entitled “Chrissy Boy Meets And Greets…”, in which he meets famous people that have either appeared alongside Madness at festivals, or that have attended awards ceremonies with Madness. Stars featured have included: Dizzee Rascal, Al Murray, Plan B, Alex James, Graham Coxon and Damon Albarn, former Madness singer/drummer/ manager John Hasler, all 6 members of the reformed Specials, ex-Bodysnatcher and Madness collaborator Rhoda Dakar, Martin Freeman, Eamonn Holmes, Jeremy Clarkson, Lulu, Peter Andre, and an Elvis Presley lookalike security guard from Australia. Dave Evans a.k.a The Edge from rock group U2 was born August 8th 1961, He attended Mount Temple Comprehensive School in Dublin, where he met fellow band mates Adam Clayton and Larry Mullen Jr. And was reunited with his boyhood friend Paul “Bono” Hewson. Mullen had posted an advertisement on the school bulletin board for musicians to form a band with him; Clayton showed up at the first practice, which also included Dik Evans, Dave Evans’s older brother, Ivan McCormick, and Peter Martin, who were two of Mullen’s friends. McCormick and Martin left the band soon after its conception. While the band was a five-piece (consisting of Bono, The Edge, Mullen, Evans, and Clayton), it was known as Feedback. The name was subsequently changed to The Hype, but changed to “U2″ soon after Dik Evans left the band. U2′s early sound was rooted in post-punk but eventually grew to incorporate influences from many genres of popular music. Throughout the group’s musical pursuits, they have maintained a sound built on melodic instrumentals, highlighted by The Edge’s timbrally varied guitar sounds and Bono’s expressive vocals. Their lyrics, often embellished with spiritual imagery, focus on personal themes and sociopolitical concerns. Within four years, they signed with Island Records and released their debut album Boy. By the mid-1980s, they became a top international act. They were more successful as live performers than they were at selling records, until their breakthrough 1987 album The Joshua Tree, which, according to Rolling Stone, elevated the band’s stature “from heroes to superstars”. Rikki Rockett, American drummer with American glam metal band Poison was Born 8th August 1961,Poison achieved great success in the mid-1980s to mid-1990s. Poison has sold over 30 million records worldwide and have sold 15 million records in the United States alone. The band has also charted ten singles to the Top 40 of the Billboard Hot 100, including six Top 10 singles and the Hot 100 number-one single, “Every Rose Has Its Thorn“. The band become icons of the ’80s MTV era and have had widespread commercial success. The band’s break through debut album, the multi platinum Look What the Cat Dragged In was released in 1986 and they hit their peak with the second album, the multi-platinum selling Open Up and Say… Ahh! which became the band’s most successful album. The popularity continued into the new decade with their third consecutive multi platinum selling album Flesh & Blood.